On Valentine’s Day what do conversation hearts, cards, and flower bouquets have in common? Give up? They all disappear…the candy gets eaten, the cards get recycled, and the flowers wilt. I ask you this: why are we showing our affection with gifts that have zero staying power? Obviously I believe that a homemade gift tops the charts, and Valentine’s Day is certainly no exception. I bet if you took a survey, asking what the most personal gift could possibly be, the vast majority will agree on photographs. 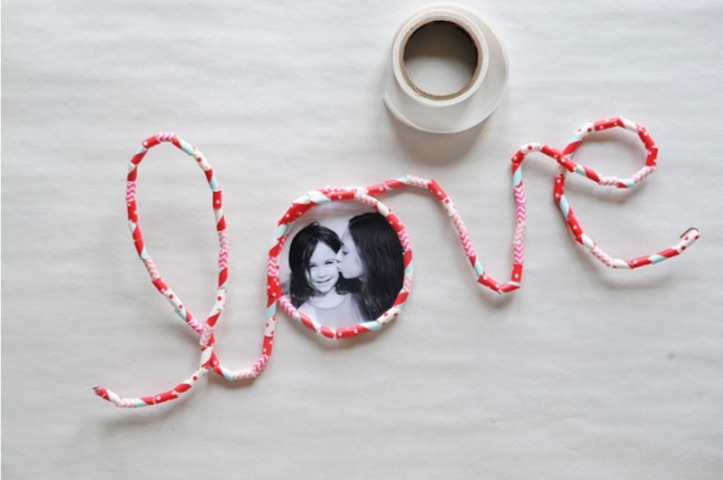 This Valentine’s Day, I’ve partnered with Nations Photo Lab to show you two clever ways to combine photographs and crafting to get your kids involved in making meaningful, heartfelt Valentine gifts with affordable photo prints. Free your pics from your memory card and phone to craft these simple but stylish Valentine’s gifts for the special people in your family’s life! This mobile takes about ten minutes to make, but can last forever. Cut the strings as long as you’d like to hold as many photos as you want! Since the photographs are not glued, your giftee can switch them out for new ones when the mood strikes. 1. Trim the point off of the skewer. 2. Tie the twine to one end of the skewer and add a dot of glue to keep it in place. 3. Slip the beads (in a pattern or at random!) over the skewer. 4. Cut the twine about 12-inches long, and tie the end to the other end of the skewer; add another dot of glue. 5. Cut pieces of twine, ranging in length from 10 inches and longer, tie beads to one end securing with a knot, and tie in between the beads on the skewer. 6. Trim photos if necessary, and clip them to the strings using mini clothespins. You can use this technique to write out someone’s name, or even to make a series of heart-shaped frames. The “O” in love makes the perfect spot for the perfect picture! 1. Cut about 7 to 8 straws into 1/4-inch beads. 2. Cut a 36-inch piece of wire (better to have too much than not enough at this stage) and fold over one end, creating a stopper. String on the paper straw beads until you fill the wire. Fold the wire over the last bead to create a stopper. 4. Lay your photo under the “O” and trace the circle onto the photo. 5. Cut inside the line that you drew, and measure it to make sure it’s fitting perfectly behind the letter. Trim off edges when needed. 6. Use mini glue dots around the periphery of the photos, and carefully stick the photo in place on the back of the “O.” You can stand the frame up on the edge of a shelf or dresser, or tie string to the “L” and “E” to hang. See the original post (plus hundreds of other family-friendly craft ideas) at projectkid.com. Laura Scruggs is the Marketing Manager for Nations Photo Lab, a professional photo printing resource based in Hunt Valley, MD. She works closely with NPL's growing community of photography lovers to create and share content that rocks. An avid fan of the ocean, football, and grammar rules, Laura lives in Baltimore, Maryland with her partner in crime.